Nano_Link and Micro_Link are now regarded as legacy products and are not recommended for new applications. The Data_Link 2000 telemetry system offers a very flexible approach to the problem of transferring signals between industrial plant on distributed sites. By utilising radio or private wires as a communication medium it offers low installation charges and minimal ongoing running costs. Applications range from simple point to point systems to large schemes interfacing with PLC’s and SCADA systems. Data_Link 2000 configures an industrial data communications network from Nano_Link and Micro_Link units. Nano_Link has been optimised for low power consumption, and low cost applications with limited I/O. Micro_Link is a more powerful device with additional communication ports and expansion capacity. The simplest network comprises two Nano_Link modules providing a point-to-point link transferring 4 digitals and 2 analogues in each direction. More complex networks are built around a Micro_Link base-station and any combination of Micro_Link and Nano_Link outstations. The base-station can poll up to 250 outstations, and every outstation can be used as a repeater if required to access more distant outstations and/or repeaters. The data routing is fully configurable, with any input on the network being available at any output, and data transparently passed to/from PLC’s and SCADA systems. Micro_Link is mechanically similar to Nano_Link, but has been designed to provide expansion capacity, more processing power and more communication ports with the trade-off of higher power consumption. It has eight digital inputs, the first four of which double as pulse count inputs. Extra pseudo digital inputs can be used to monitor alarm conditions. It also has two fully isolated analogue inputs compatible with transducers that give either voltage or current outputs. Its eight digital outputs are volt-free relay contacts, and it has two 0…20mA analogue outputs. The I/O capacity can be increased virtually without limit by the addition of I/O expansion modules. A range of expansion modules is available to cater for a variety of plant I/O types. 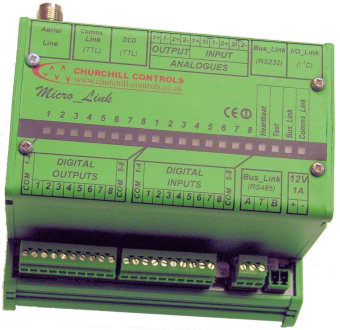 Micro_Link’s Bus_Link communication port allows it to communicate with a wide variety of PLC’s and SCADA systems using proprietary serial protocols such as Modbus. The Data_Link Configuration and Diagnostic (DCD) port can be connected to an IBM compatible PC running DCD terminal software (free-issued by Churchill Controls) for configuring the system and/or running diagnostics to analyse problems. Micro_Link can be configured to function as a base-station or an outstation. As a base-station it can communicate with up to 250 outstations. In either configuration it can be equipped with expansion modules to increase its input/output capacity without any practical limits.